I do things differently than most coaches in the industry. and, of course, Private Coaching too. With client referrals as the primary source – like, 80% – of how I attract new clients into my business, most people find out about my programs through word-of-mouth. Referrals really are the best testimonial. A past client sent an email introduction, recommending that a woman she knows connect with me. “I told you about the difference that Tara Sage has made for my business. 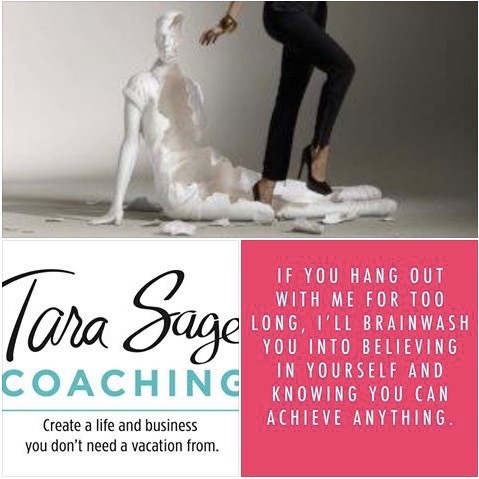 She truly is a dream acceleration coach, listens deeply for what wants to come to light for her clients, is a brilliant life hack expert and knows how to create organic workflows, compelling messages and teaches how to enroll clients gracefully and effectively. Now … while private coaching obviously provides the most customized support, something I’ve consistently heard from folks I coach in my signature coaching programs is how unique it is to find such *affordable* content-rich coaching programs with elements of self-study, that *also* include tons of personal, customized support built in. The industry standard is that you usually get one OR the other – not both. But anyone who knows me knows, I’m a BOTH/AND kind of thinker. I color outside the lines. I don’t accept that things have to keep being done the way they’ve historically been done. I always see new avenues and opportunities to create results. I love finding new ways to break old molds. I set and create my own standards about what’s possible. I’m told that this approach is rather contagious. My clients start seeing new opportunities where they thought there weren’t any. They start having courageous breakthroughs in behavior patterns. Narrow limited views become broad, vast and expansive. Possibilities they never considered before, or that seemed impossible, start coming into focus. I delight in finding new approaches to do things better. I’m fierce about my clients’ success. I don’t hold back on anything that might benefit them. The magic mix that I know really keeps people on track and in *implementation* with all the juicy content I provide in my programs … is Private 1:1 Coaching. Private 1:1 Coaching + Comprehensive anytime-access to invaluable at-your-fingertips content = The magic mix. It’s the java juice, the secret sauce, the dynamic duo. It’s the supercharged combination and the potent pairing that gets the best results. I say this from my 14+ years of experience (since 2004!) coaching individuals spanning four continents. It’s what I know makes ALL the difference for YOU, your goals, your dreams, and your success. High-level coaching doesn’t have to be cost prohibitive to be life changing. Worth repeating. High-level coaching does NOT have to be cost prohibitive to be life changing! After a realization about a new way to break an old mold … I recently did a “re-org” of how my private coaching programs and content are packaged. >>> The opportunity and value given to my private coaching clients just got sweeter. BUT – because it’s so customized, comprehensive, and cost-effective … 10 is my limit. ==> You are motivated and ready to build a life and/or business that delights you …. a life that you can’t wait to get-up-and-out-of-bed-for in the morning … a life that you won’t need a vacation from. ==> You are tired of the status quo and part of you is crying out, longing to be lived, eager for a new level of experience, because you know there has GOT to be a better way. ==> You are ready to align your thoughts, words, and actions with the life you so deeply desire. ==> You want content-rich support from a coach who “gets it”, who explains things clearly, and who provides exactly what you need when you need it to achieve your goals and dreams (and keep on achieving new ones). ==> You have a “can do” attitude, you’ve had it with excuses and feeling stuck. ==> You understand the value of support, and you want to be shown exactly how to create more joy, ease, grace, and abundance – quickly and sustainably. ==> You are ready to amp up your courage, ready to be brave and supported throughout the entire process, to step up and into creating the life that you KNOW (in your heart of hearts) that somehow, someway, you are capable of. >>> Contact me today <<< and let’s map out the exact best strategy to identify and implement the kick-in-the-pant, wholly transformative, at-your-fingertips content that is going to be most relevant and helpful to YOU, your goals, and dreams. Together, we’ll take it one step at a time. You know when something is for you. Again, www.SessionWithTara.com is the link to get on my calendar right away.